The client is a MNC with headquarters in India. The MNC is in manufacturing and supply of Textiles products worldwide. Client has physical stores in various countries. Client has an effective and wide distribution channel for selling products worldwide. Their major products are Towels, Bath mats & Rugs, Bathrobes, Bed Sheets, Cushions, Duvets and Pillows etc. The client is one of the official dealers of the iconic Wimbledon Tennis Championships – one of the biggest tennis grand slams of the year. The collection of sports towels – regular towels, face towels, fan towels and beach towels, are exclusive merchandise of Wimbledon championships. Client required to redevelop their website for UK and Germany which was previously developed using ASP.NET framework. 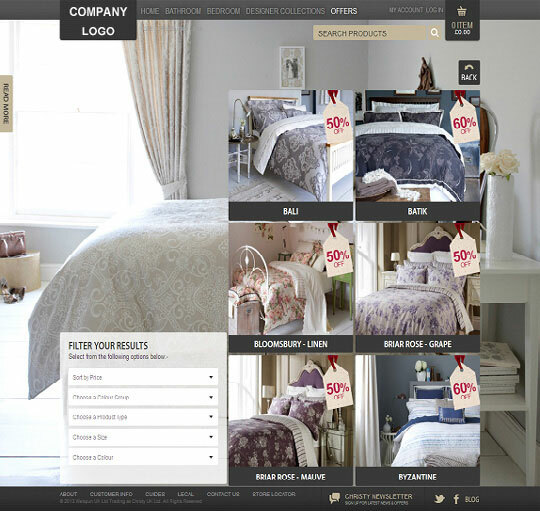 Client required multi-store web portal for selling Terry Towel and other Home Textiles online. 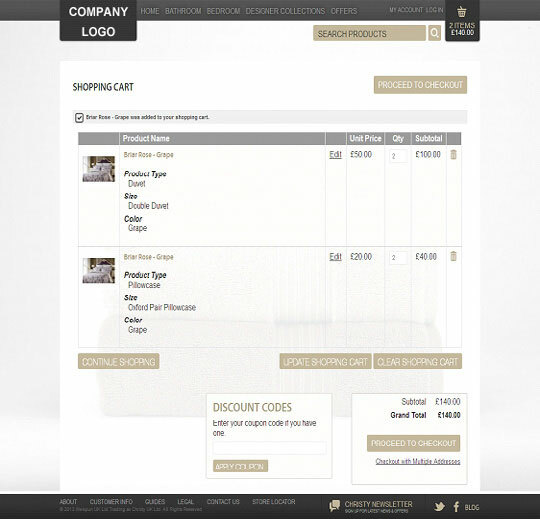 Client wanted shopping cart and online payment functionality separately for each store. Website should have image slider, promotional products, offers & discounted products in all web stores. Multi store websites to be managed by single administrator. Login and registration functionality for end users to place the order. List of alter native and recently viewed products with advanced search. Currency auto change based on end user’s IP address. Filters for the products by price/color group/ product type/size with sorting and paging functionality. Display nearest local store on Map based on end user’s IP address. Smartphone and tablet based theme. Orders, stocks, products and its categories, out-of-stock products, end users accounts, offers and content of static pages management by administrator. Stock availability for each product’s brands, types and colors for end user. Wish list functionality for future purchase. Zoom-in and out with repositioning of product image. Multi lingual – English and German. Website heritage, career and blog functionality. 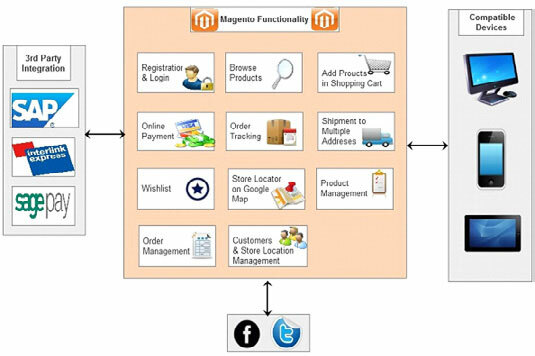 Silver Touch proposed developing the website using Magento open source platform as Magento provides many default functionalities for e-commerce website. Silver Touch has proposed MySQL as backend. Silver Touch has proposed custom java script for home page banner management and CMS functionality for static pages, managed by the administrator. Currency Auto Switcher + GeoIP Location Enables multi-currency stores to automatically switch store currency for visitor based on visitor’s IP address. 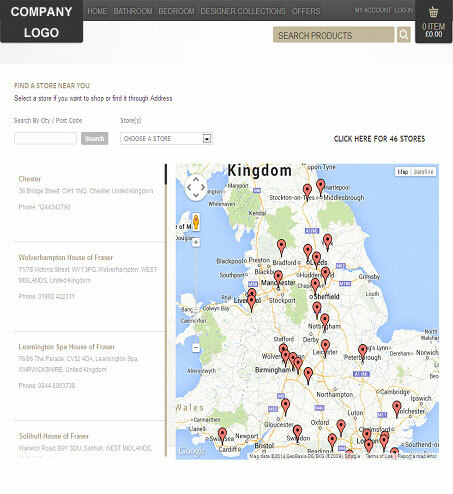 UK Postcode Address Finder Look up customer addresses from their Postcode at Checkout. 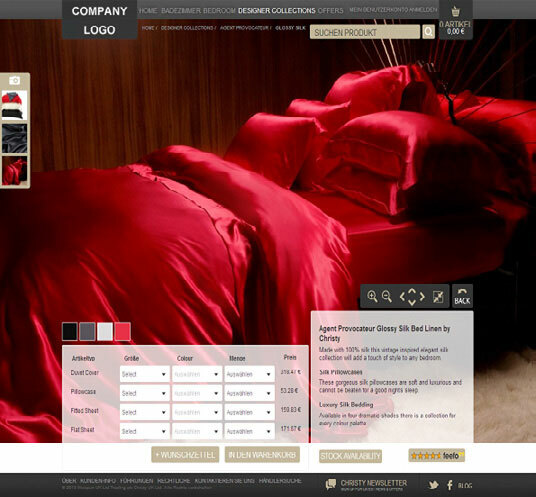 Product Color Swatch Show configurable product with thumbnail in different swatches of colors. Google Maps-Store Locator Find nearest stores on Google Map and shop over there. Out of Stock Notification Out of stock notification notifies customers whenever “Out of Stock” product is back to “In Stock”. eBay/Amazon Integration Fully integrate store into eBay & Amazon store. Layered Navigation Pro Enables customers to shop and filter by multiple attributes in a category. Great for SEO. Product Labels Creates and manages smart labels for products easily. Abandoned Carts Alerts Pro Sends abandoned cart alerts automatically. Sends reminders to guests also. MailChimp integration Analyzes order data, automates retention marketing. Smartphone and Tablet Theme A native looking mobile theme for the iPhone, iPad, Android, Blackberry, Windows 7, Palm, Kindle and more. Social Booster Extension Customers can share products in the world-wide most popular social networks just in 1 click. 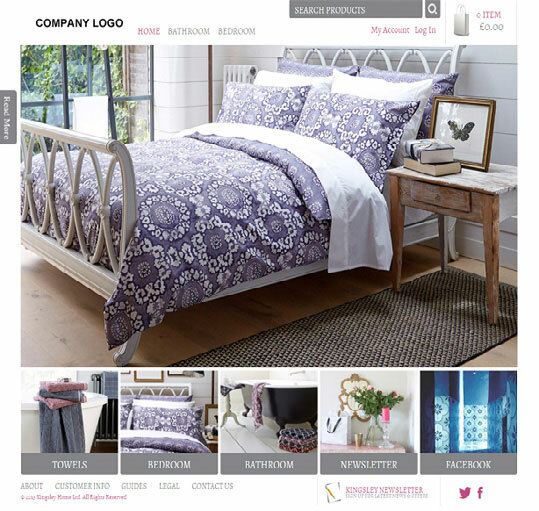 The multi store ecommerce website was developed to sell Terr y Towel and other Home Textiles products online. Website was developed using Magento open source platform with MySQL as backend. In this application multiple websites can be handled by single administrator. Silver Touch has created three sites and stores which covers all requirements of client. End users can search the products and add to the shopping cart. Once the shopping is completed the user can check out by authenticated login. Silver Touch has implemented auto currency switcher based on IP Location of end users. Portal will notify the customers whenever “Out of Stock” product is back to “In Stock”. End users can pay online through PayPal, Google Checkout or SagePay payment gateway. Advanced Search functionality is available for end-users. Website provides available color and type options with image auto-preview functionality. Website also displays client’s nearest store on Google map by end user’s IP address. End user can also search nearest store by zip code. Administrator can manage the orders, stocks, products and its categories, out-of-stock products, end users accounts, offers and CMS pages. The multi store website is available in two languages-English & German. With the help of analytics tool, administrator can easily analyze the regular customers and most selling products on the website. The website is compatible with iPhone, iPad, android and tablet interfaces. 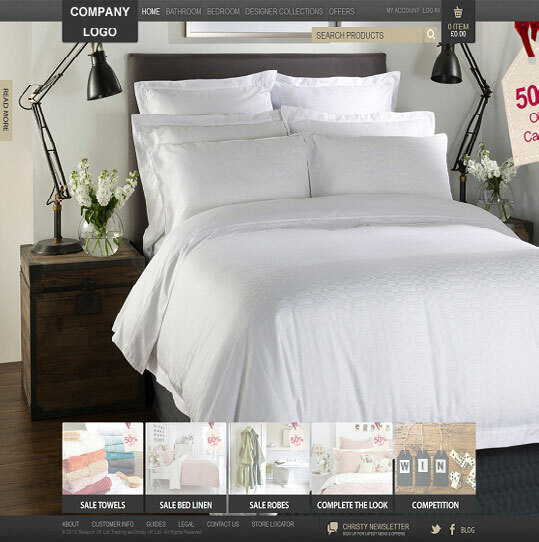 Multiple type, style and color combination of home textile products are available on multi-store site. Easily locate nearest store on Google map. Discount offers on multiple products. Roles and privileges are managed easily. Online payment facility through PayPal, Google Checkout or SagePay payment gateways. Easy to import/export the orders and stocks. Product filtering by price, type, size & color. Todevelop a Multi Store website managed by single administrator. Todevelop the website in Multi Language (English and German). Tointegrate the theme that supports Smartphone and Tablet. Tointegrate Google API with GeoIP for nearest store locator and payment gateways for online payment. Toimplement zoom in-out functionality with product image auto-preview. Toimplement Product Color Swatch for displaying color variety of products. Todisplay available stock as per product types and colors. Tosecure online payment processing on website through client provided SSL. Integration with Google map API for store locator. Product Color Swatch integration for presenting available color shades of the product to end users. Implement Auto Currency Switcher based on end user’s IP address. SAP Integration for importing and exporting CSV files. Integration with Postcode Anywhere for address auto-finder. Sales increased considerably as user engagement increased. Better and easy User Experience (UX) / User Interaction (UI). Shopping cart based e-commerce portal with secure online payment. Currency is changed according to end user’s IP address. Orders and products management of all three websites is done by single administrator. 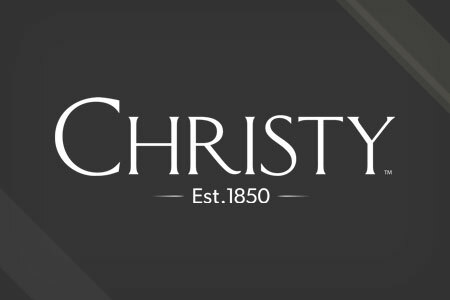 Site visitors can post the review/feedback about products. End users can easily find out discounted and popular products on site. With the help of multi store website, client acquired large customer base across UK and Germany.